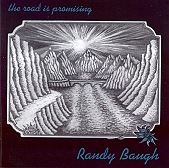 Upbeat, optimistic folk-pop from Randy Baugh, The Road Is Promising is as uplifting as it is spiritual, a warm, feel good record that won't leave you feeling lost or downtrodden. Instead, it picks you up, puts a smile on your face, and makes you remember what living is all about -the good time, the friends, and the music. The road make by rocky at times, but Baugh's The Road Is Promising is a reminder that the road is just that. I'll give it a B.